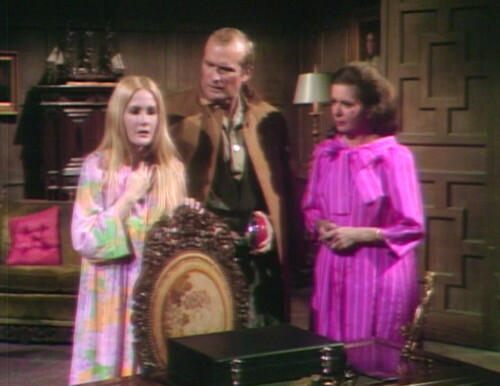 So here we are in the second straight episode by Ron Sproat, my least favorite Dark Shadows writer and the man who seems absolutely determined to crush my blog with a grandfather clock. As I discussed in “The Last Days of Ron Sproat“, there has been a fairly intense battle for — well, if not for the soul of the show, then at least for the pace. Sproat likes to keep things nice and slow, and apparently that includes his exit, which is coming pretty soon but not soon enough. Sproat’s influence is fading considerably, but it’s still a couple months before they finally pick him up by the scruff of the neck and toss him out into the streets. Right now, there are thirteen more Sproat episodes, counting this one, although why I should bother to count this one is a little hard to figure out. Because this is exactly the kind of episode that Sproat maddeningly insists upon, where characters wander in packs, roaming aimlessly back and forth between whatever sets they’ve currently got available, saying essentially nothing worth listening to. Amy: Who could have locked the door? Amy: Maybe it was Quentin. David: Why would Quentin lock us in here? Amy: Because he wants us to stay here. David: Then why won’t he appear to us? Third base! You see what I mean? The whole episode is like this. But this is what happens when you let Sproat write an episode, every goddamn time. David: I hope we don’t have to stay here the whole night. David: Ghosts only appear at night, Amy. Everybody knows that. Amy: You mean, we might have to stay in this room all night? Amy: I don’t want to stay in this room all night! And then Carolyn wakes up screaming. I don’t blame her, I would do exactly the same thing. We’re going to hear a lot today about Carolyn’s feelings. These aren’t your normal run of the mill feelings that you and I might have in the course of a day; they’re more specific, like I have a feeling that David is in danger, or I have a feeling that they’re somewhere in this house. Personally, I can’t remember the last time I had a feeling about where David is. Maybe I’m insensitive. Then they all look in a mirror while an unseen hand writes the name JAMISON on it. This is a nice visual moment, and a good special effect, but there’s kind of a smothering Sproatness about it all that makes it difficult for me to get into the spirit of things. I’m watching this scene, and all I can think is, what a thoroughly unhelpful clue. This is Magda, desperately trying to communicate that David and Amy are being lured up to a secret room in the west wing, where they’ll be killed by a vengeful ancestor named Quentin. That’s not an easy concept to get across in mirror writing, but honestly, Magda doesn’t even come close. You’d need to be pretty far along in explaining this scenario before you get to the word JAMISON. So here I am, as always, six minutes in on another twenty-two minute journey through Sproatland, and already I’m giving advice to the special effects. I shouldn’t have to backseat drive the episode like this. We need to work out a better system. Anyway, let’s check in with the kids, and see if they’ve gotten anywhere. Amy: It’s no use, David. You can’t get it open. David: I guess you’re right. Amy: What are we going to do? Okay, that’s a negative. I wonder what the adults are up to? Well, they’ve made it to the foyer, that’s something. By now, they’ve searched through the basement and looked in all the rooms, except for the west wing. They’re all clustering in a group, which isn’t very efficient. They could cover more ground if they all split up, but then they wouldn’t be able to stand around and talk and talk and talk and talk. Okay, back to the kids. David and Amy are still messing around in the storage room when they hear a haunting melody, coming from behind the wall. It sounds like an old-fashioned waltz that by next summer will hit #13 on the Billboard Top 40, which is an incredible coincidence because that’s exactly what it is. Amy: Why is Quentin playing that music? David: Maybe he’s trying to tell us something. Maybe he’s trying to tell us that he’s behind that wall. Amy: Why doesn’t he just appear to us? David: Maybe he can’t! Maybe — we must go to him! Amy: How can we? We can’t go through a wall. David starts knocking on the wall. David: That sound — that hollow sound! It means this wall isn’t solid. They cut away to Roger, who’s rattling a doorknob, but we still hear David talking from the other set. “There’s some kind of space behind it,” he says, and then I guess somebody clues him in that he’s skipped ahead in the script, so he pipes down. Roger says the door to the west wing is locked, so the kids can’t be there. Carolyn disagrees, on account of she has a feeling, but the others vote her down. I guess that’s why they have to stick together in groups of three, so they have a tiebreaker. 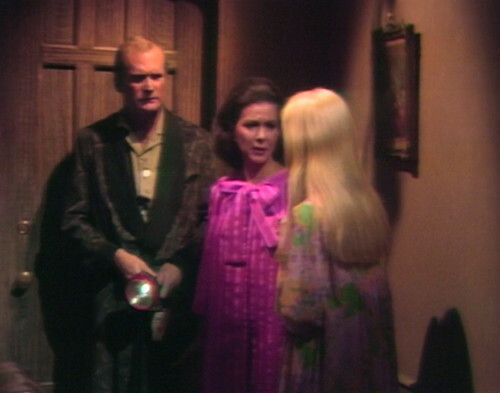 Roger walks down the hall, saying, “Come on, we’re wasting time,” as if that was a serious issue in this episode. Now we rejoin the scene in the storage room, already in progress. David: Maybe Quentin has told us all that he wants us to know! Maybe he just wants us to know that he’s behind that wall! Amy: Well, why doesn’t he just appear to us, then? David: Maybe he can’t! Maybe we must go to him! Amy: But how can we? We can’t go through a wall. Yup, they just go right ahead and start the scene over. And then he starts knocking on the goddamn wall all over again. David: That hollow sound! That means that this wall isn’t solid! David: No! There must be some kind of space behind it! 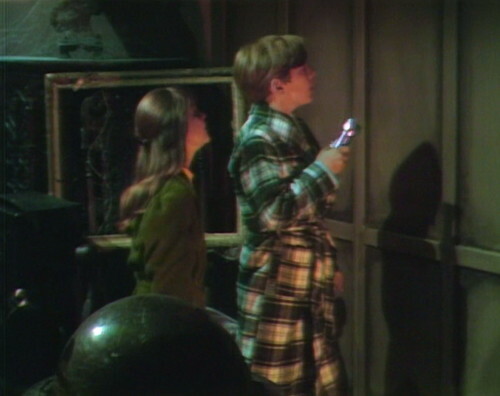 This leads to another scene of Liz, Roger and Carolyn, who are still squabbling over whether they should search outside or not, which means that we’re stuck in a time loop again. It feels like we’re always getting stuck in a time loop these days, although I suppose that’s the whole point. So guess what, Carolyn has a feeling. She feels a hand pushing her toward the door, which according to her means that Magda wants them to go and search the west wing, which coincidentally is the same place that Carolyn’s been saying that she wants to go this whole time. Now, I don’t know about you, but I’m starting to resent having everybody getting pushed around by unseen forces today. I think if Magda wants to be in charge of the episode, then she ought to show up and do it in person. 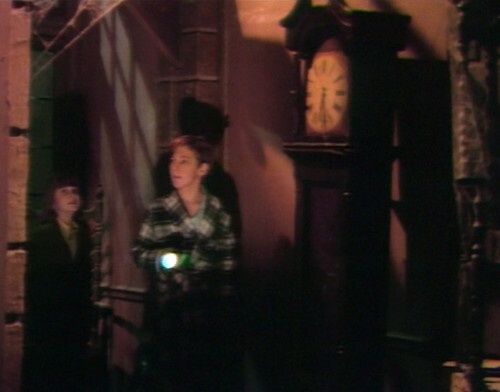 Walking through the west wing, Carolyn, Liz and Roger take a moment to survey the recent clock carnage. Roger is surprised; the clock was standing up the last time he was up here. Liz says, “It doesn’t necessarily mean something,” and Roger says, “No, I suppose not,” which is about as neat a summary for this episode as you could find. And so our intrepid adventurers finally make their way into the room that David and Amy are actually currently in, except they’re hiding behind a trunk. Liz thinks that she hears a noise from the other room, so they leave and go check it out. Meanwhile, on the astral plane, Magda rolls her eyes and says, maybe I should try to find another family to help. Carolyn pulls the door shut behind her as they leave the room, and David and Amy come out of hiding to check if the door is stil locked. It turns out that it is, because this episode is a Möbius strip. Then they start talking about the wall again. “Well, that was a waste of time,” Roger says, as they get back to the drawing room, and Carolyn says, “I still have a feeling they’re somewhere in this house.” Etcetera. 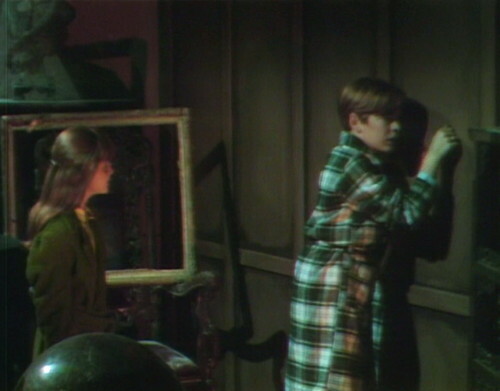 Finally, the kids take a crowbar and bust their way through the wall, and there’s another room behind it. They decide to go through into the next room, and then the episode is over. And that’s one more Sproat episode down, with twelve to go. If anyone needs me, I’ll be in the west wing, hiding behind a trunk. 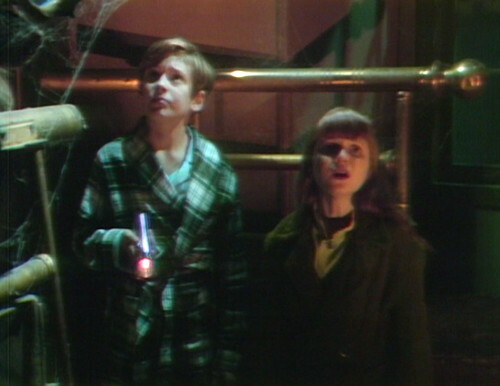 David and Amy are worried that they may have to wait in the storage room all night, although we saw at the end of yesterday’s episode that it was 4am, so it’s not like it’s going to be a particularly long wait. They have trouble with the end credits today. The theme music plays for about twelve seconds before the credits show up. When they switch to the production credits, they shake a little bit, and then the rest of the credit roll is crooked. 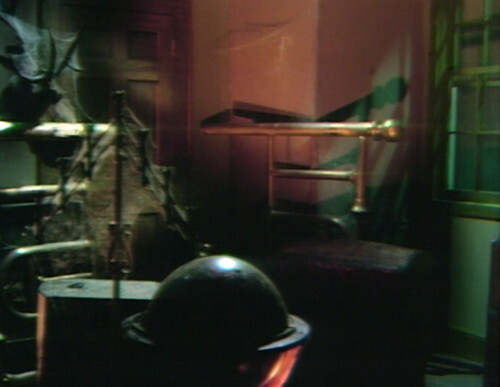 This episode is the first time we hear “Quentin’s Theme”, a mournful but catchy waltz played on violin and piano. We’ll be hearing it a lot in the coming months. The tune was written by Dark Shadows composer Bob Cobert, and it was originally used for a 1968 TV-movie adaptation of The Strange Case of Dr. Jekyll and Mr. Hyde that Dan Curtis made for the Canadian Broadcasting Company. That last shot of David and Amy peering into the darkness with flashlights, looks just like the shot of Willy Loomis as he opened the secret room of the Collins mausoleum, way back in black and white. What lurks behind door number two? The “back to basics” approach is telling. After the nadir of the Nicholas’s performance improvement meeting with the Devil, this episode is a refreshing contrast. A haunted house and an evil spirit is closer to the original DS’s roots — perhaps most telling in that the focus is again on the “normals” and not the ghouls. Even Chris Jennings is otherwise normal and his “monster” side is so distinct from him as to be played by a separate actor. Tangentially, all this time, I’ve viewed the creepy spelling of JAMISON on the mirror as being Quentin’s doing. This is not to claim that I’m right so much as to agree that Sproat’s writing in the episode is unclear. I saw The Strange Case of Dr. Jekyll and Mr. Hyde back in the day (in the U.S., I should note). I was an enormous fan of Cobert’s music, and I recall that the Dr. Jekyll cues, save for the waltz in question, were the same as DS’s. Same recordings, I mean, though I could be mis-remembering. I remember the movie having the same sloppy tape splices as DS, wherein the video jumps with each cut. At the time, I was surprised to see a video-taped TV movie. It seemed novel. I read the Stevenson novel as a teen and was amazed by how much Hollywood and TV moronicized it. Am I incorrect in saying the Spencer Tracy/Ingrid Bergman movie of Jekyll and Hyde was pretty darn good , especially from that movie era, or was it good, because of the above actors? It was better than the 1931 version, which is a very small compliment. I thought both actors were miscast. Tracy, especially. Movie Hydes are invariably wild-eyed stage villains, and he’s not the type. He could have played Jekyll and Hyde as written, though, but no one’s going to go back to the novel. Hollywood wants romance and villains being chased through the street. That being the case, they needed Victor Mature, maybe. And then Carolyn shrieked with even more horror and terror when she looked in the mirror, and saw it spell out: R O N S P R O…..
I’m now finally on board with the notion that the makers of Dark Shadows had absolutely no idea what they would be doing one month to the next, and that the 1897 storyline involved zero planning ahead of time. This weekend while watching disc 87 of the coffin box set there was a Dan Curtis interview in which he makes a significant revelation about how the 1897 story came to be. He also describes meetings huddled with writers at two, three in the morning as they struggle to think of what to do next. The 1897 storyline served the same purpose as did the 1795 storyline. The only reason they went back to 1795 was to keep the Barnabas character going and explain how Barnabas became a vampire. Likewise, they only did 1897 to explain what happened to Quentin. But for this step to be taken Quentin first has to become popular, and at this point the audience hasn’t even seen him. 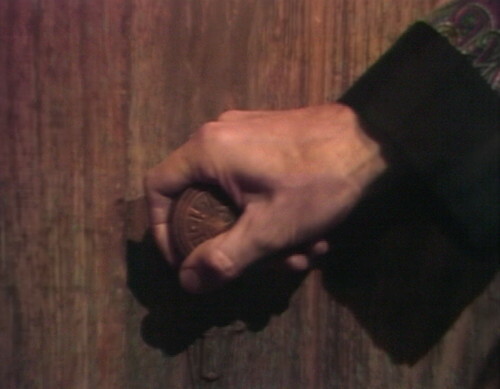 The reason the 1897 story seems to have some foreshadowing is because of the bits of backstory they throw in, the way they did with Barnabas when he first arrived. But as the 1897 storyline develops, certain details will be changed and rewritten as they were regarding Barnabas and his background in 1795. So, at this point, time travel to 1897 isn’t even a glimmer in the mind of Dan Curtis, and likely wasn’t even brought up as a possibility until long after Quentin has driven everyone out of Collinwood. 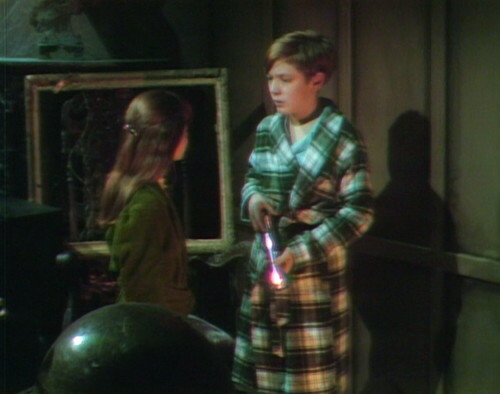 Of course, once well in to 1897 we’ll find out why Quentin comes to haunt Collinwood and what his interest in David is, which would seem to negate the present Turn of the Screw remake they’re doing because Quentin would only have symbolic interest in David. He wouldn’t otherwise bother showing himself to Amy and possessing both children. But this is another point for another post further down the line. I’ve used the term “road to 1897” and I should clarify that I don’t mean that the show itself is on a deliberate road to that time period — just that I’m intrigued in the journey to what many consider the series’s peak. It’s sort of like if I got in the car tonight with a half of tank of gas and three months later wound up in New Orleans. That’s potentially a more interesting story than if I’d actually planned and executed the trip logically. But the best way to explore this journey is to not think of the ultimate destination as planned in any way. Right now, we’re seeing a ghost story. References to the past make sense because ghosts are intrinsically part of the past. The ultimate revelation that Chris is a descendant of Quentin’s and ultimately a Collins in his own right reminds me of the Skywalker siblings from STAR WARS. It’s not the sort of thing you plan from the beginning because of the obvious ick factor later. Chris and Carolyn are adorable together now, so it’s a shame that the relationship is quickly written out of the show once they return from 1897. I’ve mentioned before that Selby’s popularity hits Briscoe hard before even rising to the point that it could almost (but not quite) eclipse Frid. 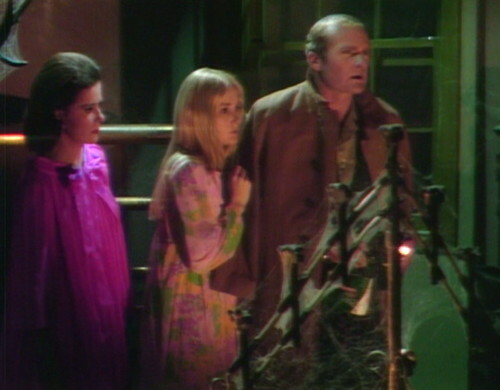 It’s good to see the core Collins clan in a scene together again – this family dynamic got pushed aside by Barnabas and Company. Also for some reason the first impression I get of Amy is that of a pushy instigator who caused this situation from Day 1. For many years David ‘ruled the West Wing’ and received great joy from using ‘his lair’ to torture his current governess Vicki as well as future governess Maggie (and probably countless others in the past). Now all of the sudden Amy comes out of nowhere and causes these problems. So it’s technically her fault that Quentin got all stirred up – not that this is a bad thing but I’ll always prefer the more innocent and sympathetic persona of young Sarah Collins to Amy Jennings. Here’s my bunch of guesses: I would imagine the idea for a big trip back to the Victorian era came sooner, rather than later. When they saw how successful the trip to 1795 was, they were probably just waiting for the chance to do it again. My guess would be that, by the time they were getting rid of Eve, they would have had at least a thin, but far-reaching outline that involved Chris, Quentin, the werewolf curse, and a big trip to the Victorian era to sort it all out, and explain the connection. An outline like that could have kept them going for a year. I have no idea, that just seems like they way it would have begun. Their luck had been good, they were on a roll. They had good reason to think big. 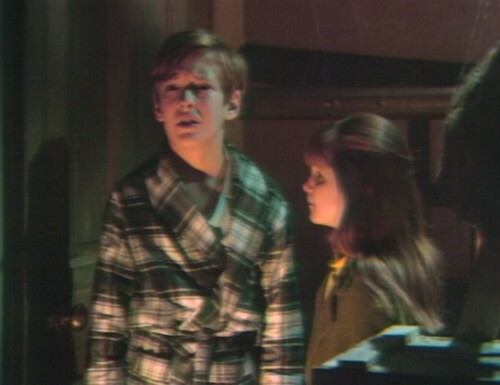 One of the most important things about trips to the past with Barnabas was when they realized that when he goes to the past, he becomes a vampire again. How convenient. He’s cured, but still gets to be a vampire. All he has to do is slip off to the past, and it’s fang city. It’s his Las Vegas. The past is Barnabas Collins’s Las Vegas. Except that what happens in 1795 or 1897 doesn’t always stay there. Sometimes, magic is like a really bad venereal disease, that spans the ages. 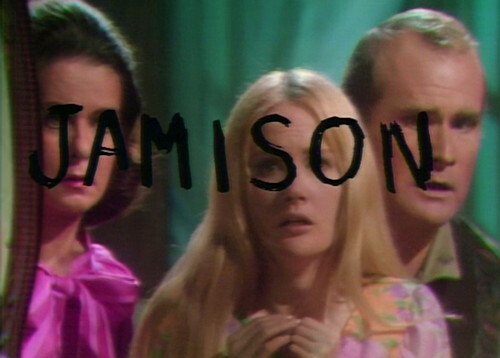 Wait, Danny, wait….I thought your least favourite Dark Shadows writer was Malcolm Marmorstein? How quickly they forget…. Also, Roger and Liz look like total dopes in this episode. Seriously, they really think a locked door would stop David from being in the West Wing? I guess they forgot about all those times he would sneak in and out willy-nilly, regardless of their orders. 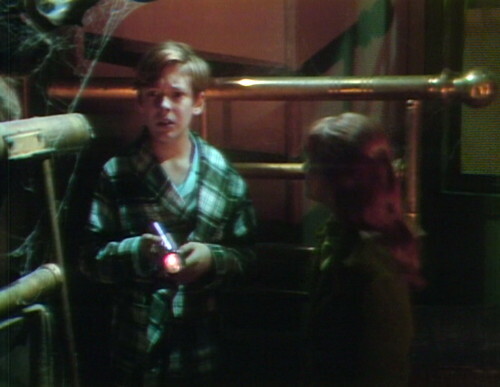 Not to mention the secret passage which Roger (and as we learnl later, Liz) is aware of that leads to the West Wing. Silly geese. 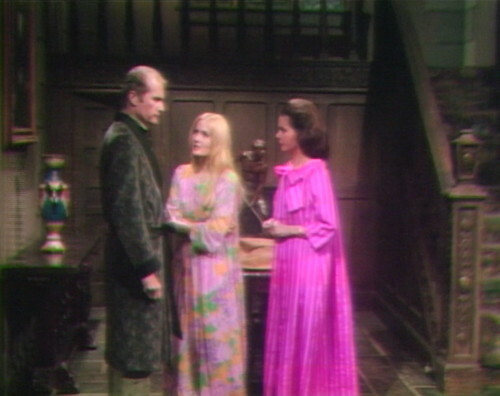 Dark Shadows really could have used a person to keep track of basic continuity regarding storylines and character relationships. I can see viewers who keep track of these sort of things becoming very annoyed at the laziness of the writers and total disregard of events past. 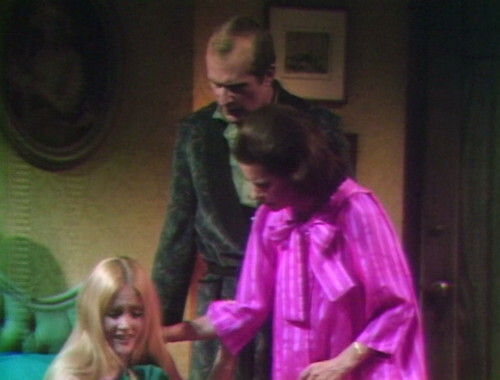 “Dark Shadows really could have used a person to keep track of basic continuity regarding storylines and character relationships. I can see viewers who keep track of these sort of things becoming very annoyed at the laziness of the writers and total disregard of events past.” Any such viewers in 1968 would have been few and far between. 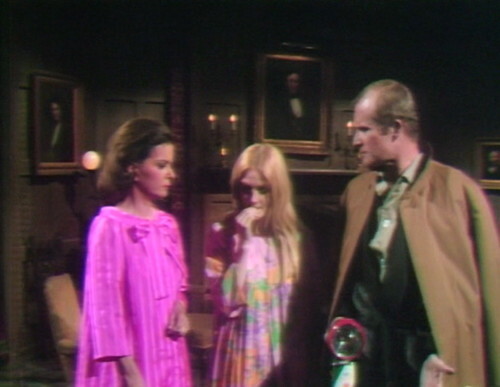 Everyone else at the time is watching DS like a regular 1968 soap opera, which means they see an episode once and it’s gone forever (and they miss a lot of episodes). For those reasons, it would be a waste of time and probably money to have some kind of continuity master since continuity really didn’t matter except in the very broadest sense (for example, Roger suddenly becoming Elizabeth’s husband instead of brother couldn’t be done). Few if any viewers would have remembered a lot of these details–and either Dan Curtis and the writers didn’t care or didn’t remember, either. There was no point in their going back to old scripts to check continuity, either. thank you Pedro. love your silly geese. Here’s an interesting tidbit regarding how far in Advance the DS writers planned things. Jonathan Frid wrote a letter to his mother in August of 1967 saying the show was was going to explore the history of his character, so he was feeling confident that he would have a few more months of work. 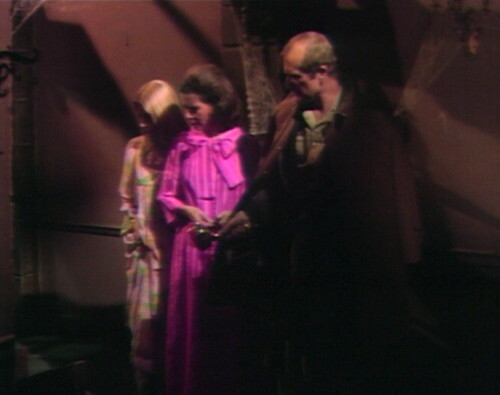 That’s about a month after Barnabas’ costume party, which is what I think gave them the idea for 1795. So they were thinking at least 3 months in advance for that (or more realistically it took them that long to figure out how they were going to do it). Joanne, the DS writers weren’t lazy; they were overworked, underpaid, understaffed, and flying by the seat of their pants all the time. They had to put out a show every day. Given all that, it’s even more amazing that the produced such an entertaining and enduring show. “Well, that was a waste of time,” Roger says. This was a five minute episode. How could the show fall so quickly? Even Sam Hall wrote the uninspiring Durkin lines before this ep. Makes me wonder if was indeed Sproat the whole time. Violet, Violet, come to us. Dan Curtis used Cobert’s music in the 1973 TV movie “The Picture of Dorian Gray”, starring Shane Briant, Nigel Davenport, and our very own John Karlen. The familiar cues as well as “Quentin’s Theme” are heard throughout the production. I suppose there wasn’t any money in the budget for a new score. Did David speak his lines early while Roger, Liz, and Caroline were at the door of the West Wing, or was that so we’d know they were in that room and about to be found? It’s more than that. 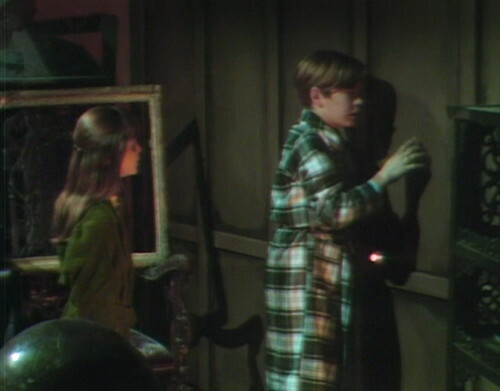 When the scene returns to David and Amy, they start much of the scene over again and repeat the whole thing from hearing Quentin’s music coming from the wall to David discovering it’s a false wall. The sole purpose of this half hour was to prominently feature Joan Bennett’s electric fuchsia peignoir. That’s how they did things in the Golden Age of Hollywood. Re: the credits taking a long time to appear at the end as the music plays, I wonder if this less a blooper than a time filler. They had a whole minute and a half to fill with the end music and credits this time, so I wonder if they just let the music play for a while before the credits started to fill up time.